Unique pyramid shaped stone ejectors help to eliminate stone retention. 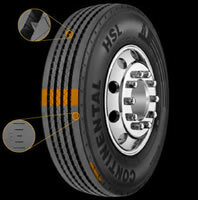 Five rib tread design provides excellent wet traction and lateral stability. Shoulder Protection Rib resists irregular shoulder wear.